From time to time governments, professional associations and other organisations develop and use urban policies to help articulate and drive the changes necessary to help make our cities productive, liveable and sustainable. One such example was the National Urban Policy developed by the Federal Government in 2011, which endeavoured to provide a long-term national framework to guide policy development and public and private investment in cities through articulating a set of goals, objectives and principles. Productivity: To harness the productivity of Australias people and industry, by better managing our use of labour, creativity and knowledge, land and infrastructure. Sustainability: To advance the sustainability of Australias natural and built environment, including through better resource and risk management. 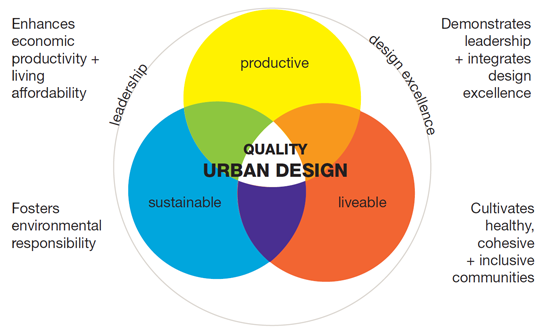 Liveability: To enhance the liveability of our cities by promoting better urban design, planning and affordable access to recreational, cultural and community facilities.